The Device List Tool of your Linksys cloud account allows you to manage and monitor your devices’ connectivity to the network. 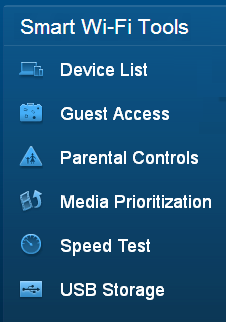 It can be found on the Linksys Smart Wi-Fi Tools navigation menu. The Device List is displayed as Network Map Tool among the latest Linksys Smart Wi-Fi Routers. To learn more about this feature, click here. 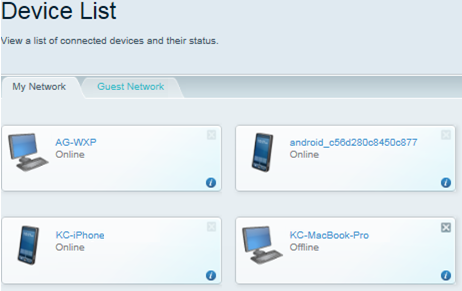 In the Device List page, you will be able to see the devices that are connected to the router whether they are online or offline. QUICK TIP: Online means the device is turned ON and is currently accessing the network. Offline means the device is turned OFF and is not connected to the router. Devices that were previously connected to the router would still be displayed in the Device List even when they were powered OFF. If you want to update the status of your devices, you will need to clear your browser history. There are two tabs in the Device List section of your Linksys cloud account: My Network and Guest Network. To see the list of connected devices, click the tab of your preferred network. Clicking on a device name displays details such as its name, manufacturer, model, IP and MAC addresses. To learn more about changing the name or icon for a device, click here. NOTE: Switches and other passive devices are not required to be detected in the Device List page. Computer – a computer or laptop you want to connect wirelessly. To learn more of this procedure, click here. WPS – a device that uses Wi-Fi Protected Setup™ (WPS) to connect wirelessly. If your device has a WPS logo on it, it supports WPS connections. If you want to use this feature, click here for instructions. Other – a wireless device such as a camera, smartphone, gaming console, wireless printer, or any other device that can connect wirelessly to a router. To start connecting wireless devices to your router, click here for the step-by-step instructions. USB Printer – choose this option if you want to connect a printer to your router using a USB cable. Click here for instructions on how to connect a USB Printer on your Mac® computer, and here for Windows®. QUICK TIP: To know how to display and remove the tools on the Linksys Smart Wi-Fi homepage, click here. If you want to connect a guest's device temporarily, you can use the Guest Access Tool. It gives your guests internet access, but not shared devices such as printers and shared drives. For an overview on this Tool, click here.